” … to make landfall anywhere in the world on record” (Capital Weather Gang). 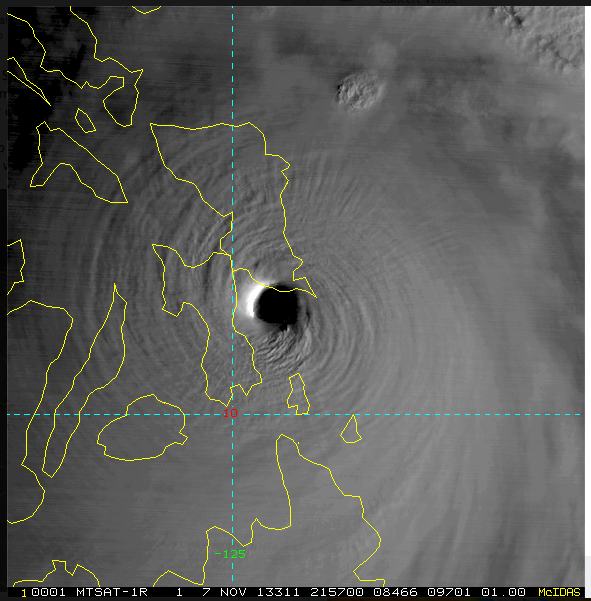 This is an image of Super Typhoon Haiyan making landfall on November 8th in the Philippines. I’m not looking forward to more record-breaking weather! Devastating human impacts from such events are obvious, but whether or not they provide the incentive to change our behavior to limit greenhouse gas emissions remains to be seen. UPDATE: Now we know. A terrible tragedy. Some of the most significant climate activism has originated in the Philippines. Their vulnerability has been undeniable all along. Image courtesy of CWG tropical weather expert Brian McNoldy.